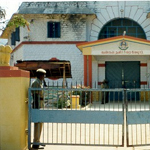 VELLORE PRISON :his Prison started functioning from 15.04.1836. This is a pioneering Institution in the country started for the welfare of women. This Prison was originally named as Presidency Jail for Women Prisoners. The area occupied by this Prison is 13.62 acres. The authorised accommodation is 412. This Prison is managed by Women Officers and staff. There is a nursery and crèche available in this Prison to look after the welfare of the children accompanying the Prisoners.